In case you didn't have enough too worry about in terms of death raining down from the sky from remotely guided drones, now comes word that completely autonomous killer robots aren't just minions of Skynet, they're a likely presence in our near future. A new report released by Human Rights Watch cautions that "killer robots" (their words, not mine) could reach battlefields within the next few decades, and it strongly suggests that humans try to legislatively head-off that long-feared development. With the rapid development and proliferation of robotic weapons, machines are starting to take the place of humans on the battlefield. Some military and robotics experts have predicted that “killer robots”—fully autonomous weapons that could select and engage targets without human intervention—could be developed within 20 to 30 years. At present, military officials generally say that humans will retain some level of supervision over decisions to use lethal force, but their statements often leave open the possibility that robots could one day have the ability to make such choices on their own power. As that paragraph makes clear. 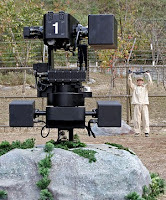 the technology of "fully autonomous weapons" is highly speculative. To some extent, it seems to require that ever-elusive "artificial intelligence" that is either going to enslave us, or turn us all into scut-work-free philosopher kings, depending on your favorite science fiction writer. But it's obvious that military researchers are trying to move beyond the human-in-the-loop weapons that characterize remotely controlled drones in an effort to develop weapons that can select their own targets.